Many Germans resisted Hitler and National Socialism and were executed as enemies of the state. Some are famous. Dietrich Bonhoeffer was imprisoned for two years, then hanged a month before the war’s end. Sophie Scholl, along with her brother and a few friends of the White Rose resistance group, was arrested, given a quick trial, and beheaded within four days. 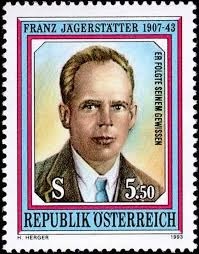 Another resister was Franz Jägerstätter. Born in Austria, he received a seventh-grade education, but read widely. He gained a deep biblical knowledge and applied scripture to interpret current events. He voted against the Anschluss to join Austria to the “Greater Germany.” He believed Hitler was evil, and he refused to take the oath of military service to a state that was pillaging and destroying human lives. For his stand in 1943, he was beheaded at age thirty-six, leaving a widow and three daughters. His writings reveal his insights. Franz was beatified by the Catholic Church in 2007. “I believe the German-speaking people never participated as strongly in Christian charitable activities as they are now engaging in the N.S. organizations. Nor were they as ready to contribute their money to church programs. “Suffering during our earthly lives is not the worst thing. Even the saints had to suffer frightfully until God took them into eternal life. The Lord did not spare even his apostles from suffering, and most of them lost their lives through martyrdom. And the prospect of martyrdom did not deter them from working so much for Christ. “If we study history and look into the past centuries, we are not surprised that we are in this situation today. Over the years, a deep and devout faith has increasingly receded, and a new paganism has increasingly pushed ahead. “By his harsh suffering and earthly death, Christ has redeemed us from eternal death but not from earthly suffering and death. Would we have the courage to stand fast as he did? I've never heard of this man. Very interesting. He had such a strong faith. His words are very fitting in our world today with all the persecution of Christians in the Middle East. His words are very true. I wonder how far off our country is from whole scale persecution of Christians today with the social issues our country is going through. Not a pleasant thought to think the US could become like that, is it? Beautiful post. I've wondered about this more this year as we've watched Christians slaughtered for their beliefs. And more were targeted to be murdered in Paris this weekend. Our world can be scary, but thank God, He's bigger!